In this post I’ll show how I display chess pieces — in ugly way, which I definitely have to rewrite to use Backbone model instead of HTML manipulation with jQuery. 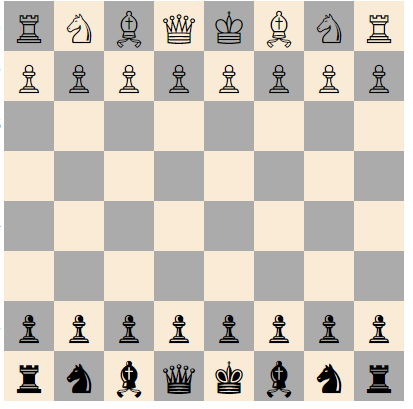 Fortunately, chessboard pieces can be drawn without any custom fonts or images — they are available as Unicode symbols. How to display them in proper squares? They should be passed to model, then displayed from model… But I didn’t have time. Also, it’s good to practice refactoring from bad solution to good solution, cause it may happen many time in our 9–5 — at least in my opinion. Calling setTimeout will add a message to the queue after the time passed as a second argument. If there is no other message in the queue, the message is processed right away; however, if there are messages, the setTimeout message will have to wait for other messages to be processed. For that reason the second argument indicates a minimum time and not a guaranteed time. Important note: I use here Array.from() factory method. This nice feature from ES 6 allows us to create pure JS array from array-like objects, like document.querySelectorAll() result, which makes dealing with DOM API much more less painful. It is very basic solution, moreover — it’s useless when it comes to, for example, calculating possible moves for piece. So, in the next post I will prepare displaying pieces for calculating possible moves — probably to extensive usage of Backbone.Model.